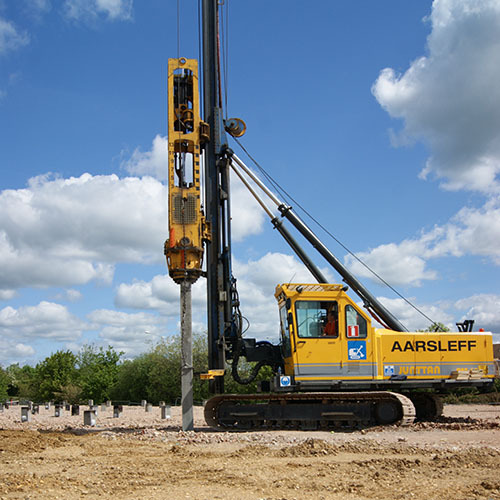 Piling and specialist ground engineering contractor, Aarsleff Ground Engineering, is a trusted and renowned piling contractor who offers a wide range of methods to lay the foundation for your building or structure. With its in-house technical, estimating, design, manufacture, and installation engineers, you can benefit from the best expertise for your project. Our aim is always to offer smarter and more sustainable solutions to the engineering industry. Specialising in the design and installation of piling, foundations, ground engineering, ground improvement, and geotechnical, we have the skills, knowledge, and experience to work on a wide range of projects ranging from single plot houses to large residential developments. Already one of Denmark’s leading contractors, since becoming established in the UK in the 1980s we’ve gone from strength to strength. Our sister company Centrum Pile Ltd has an advanced piling manufacturing facility from which we source all our reinforced concrete piling solutions.